1. Pour the water into a pan and place it over low/medium flame. 2. Add ginger garlic paste, cinnamon, cloves, coriander paste, onions, pepper powder and salt. 3. Bring to a boil. 4. Add turmeric powder, maida (mixed with water) and bring to a boil again. 5. Add salt and lemon juice. 6. 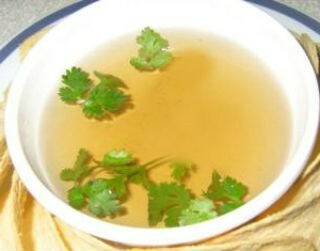 Stir well and garnish with coriander leaves. Feel free to comment or share your thoughts on this Coriander Lemon Soup Recipe from Awesome Cuisine.